Highbridge Doughboy, September 28. Photo by Joe Conzo. On September 28 New York welcomed back a long-lost sculpture to the Bronx. For more than 40 years a Doughboy memorial from 1923 had been kept in storage, after vandalism in the 1970s had caused its removal. 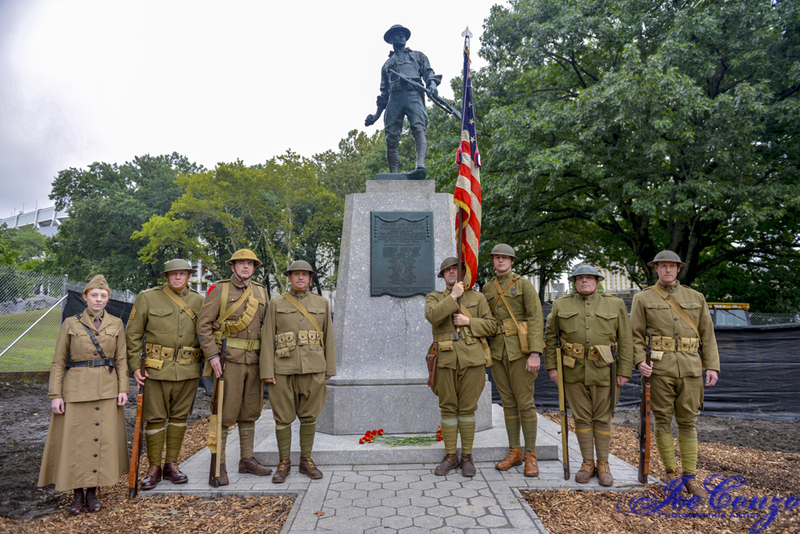 It was restored at great expense by NYC Parks, with support from the U.S. WWI Centennial Commission and the History Channel. The sculpture now in a new landscaped part of Macombs Dam Park, on East 161st Street and Jerome Avenue. This is across the street and in the shadow of Yankee Stadium. 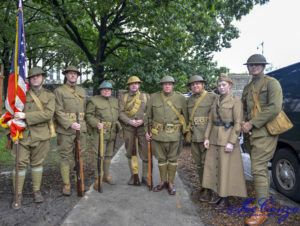 Members of the East Coast Doughboys were invited to participate in the ceremonies. We also had with us our friends Michael Cumella, playing a vintage phonograph and 1918 records, and Michael Davis, to perform Taps and The Last Post. ECD photo by Joe Conzo. Early in 2018 the ECD used a group of our members to research the names of the 21 men listed on the memorial. These mini biographies were then presented at the ceremonies. They will be published online. Thank you to New York City Parks for restoring this monument, in particular Jonathan Kuhn who never forgot about the Doughboy while he gathered dust for four decades. The last American veteran of World War One passed away in 2011. Today we have reenactors, living historians, to keep their memory alive and honor their contributions and service. It was members of this group of my friends, WWI reenactors, which researched the 21 men listed on the memorial. A tablet, I’d like to add, that was stolen in 1974, and the Department of Art & Antiquities, NYC Parks & Recreation, who took great pains to make a replica of. Who were these 21? All of who were from this area of the Bronx? They were Morris High School graduates, clerks, conductors, electricians, painters, printers, and salesmen. Second Lieutenant Milt Hogel quit Cornell to learn how to fly. Private Joe Holahan was a young teacher at Fordham. Both died in training, never leaving the United States. Private Pasquale Di Meo dug the tunnels for the subway we ride today. He survived combat, only to die once he returned home. Eleven of these men died in France, the rest in the United States during training or of sickness and disease. Two are still missing in action. Most served in the Army, but four were sailors and three were in Air Service flight school when they lost their lives. 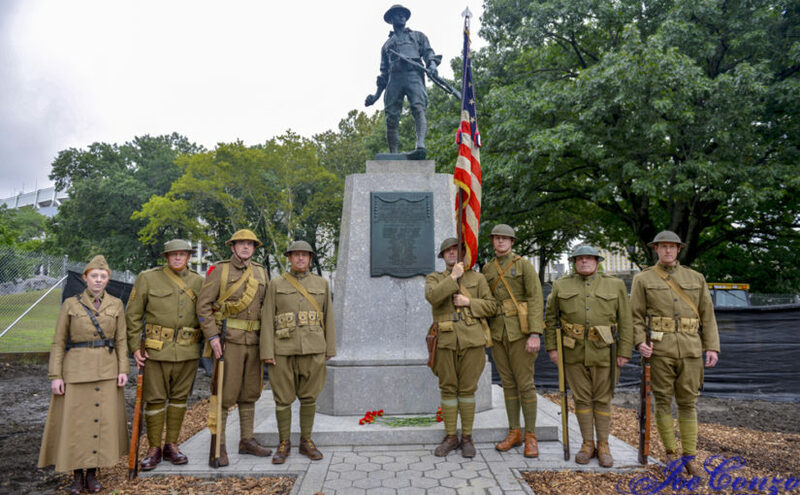 The men served in all of the New York divisions that were fighting in the Meuse-Argonne battles a century ago today. Four were in the 27th Division, O’Ryan’s Roughnecks, and two in the Irish Fighting 69th. Private Johnny Conrad, from Daly Avenue, and PFC Richard Stahl, from Featherbed Lane, both died on the same day: Conrad in France and Stahl in the U.S. That date was 100 years ago yesterday. Second Lieutenant James Cowan Andes from Ogden Avenue was posthumously awarded the Distinguished Service Cross, the second highest military award for bravery and extreme gallantry. Lieutenant Andes received another honor 90 years ago; the main street on Governors Island that all visitors walk down is named Andes Road. All of these names are engraved here, once again, and returned to the neighborhood. Yes, a memorial such as this sculpture is designed to honor the sacrifices of those who served our country. But it’s also for us, the ones born generations after the war. We are the ones who walk these streets where the men and women who fought a century ago once tread. We are the ones who are left to remember their names so that they are not forgotten. This is why this tablet was recreated and placed on the pedestal. Now this sculpture is back, to a place of prominence in the Bronx. Those attending a game or match at the stadium, or park visitors across the street, will see this monument and know that this neighborhood paid a heavy price a century ago. Then it will not be living historians who keep their memory alive, it will be the local residents and thousands of visitors who will pass this park.